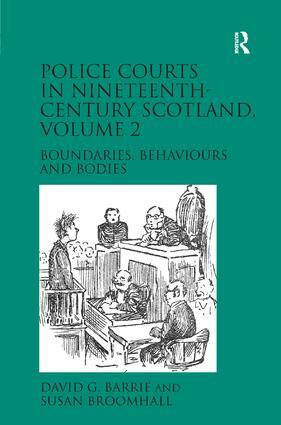 Volume 2 of this two-volume companion study into the administration, experience, impact and representation of summary justice in Scotland explores the role of police courts in moulding cultural ideas, social behaviours and urban environments in the nineteenth century. Whereas Volume 1, subtitled Magistrates, Media and the Masses, analysed the establishment, development and practice of police courts, Volume 2, subtitled Boundaries, Behaviours and Bodies, examines, through themed case studies, how these civic and judicial institutions shaped conceptual, spatial, temporal and commercial boundaries by regulating every-day activities, pastimes and cultures. As with Volume 1, Boundaries, Behaviours and Bodies is attentive to the relationship between magistrates, the police, the media and the wider community, but here the main focus of analysis is on the role and impact of the police courts, through their practice, on cultural ideas, social behaviours and environments in the nineteenth-century city. By intertwining social, cultural, institutional and criminological analyses, this volume examines police courts’ external impact through the matters they treated, considering how concepts such as childhood and juvenile behaviour, violence and its victims, poverty, migration, health and disease, and the regulation of leisure and trade, were assessed and ultimately affected by judicial practice. David G. Barrie is Associate Professor of British History at The University of Western Australia and Susan Broomhall is Winthrop Professor of Early Modern History at The University of Western Australia.